288 x 207 mm. With 28 large woodcuts by the Master of the Ulm Terence. First edition of Terence's, Eunuchus, in German: Ain Maisterliche und wolgesetzte Comedia. Translated by Hans Neithart. – Preceded by: Ortolf von Baierland, Arzneibuch. Nuremberg: Anton Koberger, 1477. First dated edition. 288 x 207 mm. – I. 103 leaves. With 28 nearly full-page woodcuts by the Master of the Ulm Terence. II. 86 leaves. I. The famous Roman playwright Terence (c. 195/185 – c. 159 BC) wrote only six comedies. The present translation of his Eunuchus is the earliest classical play in any vernacular language; it is also the first illustrated edition of an ancient drama. 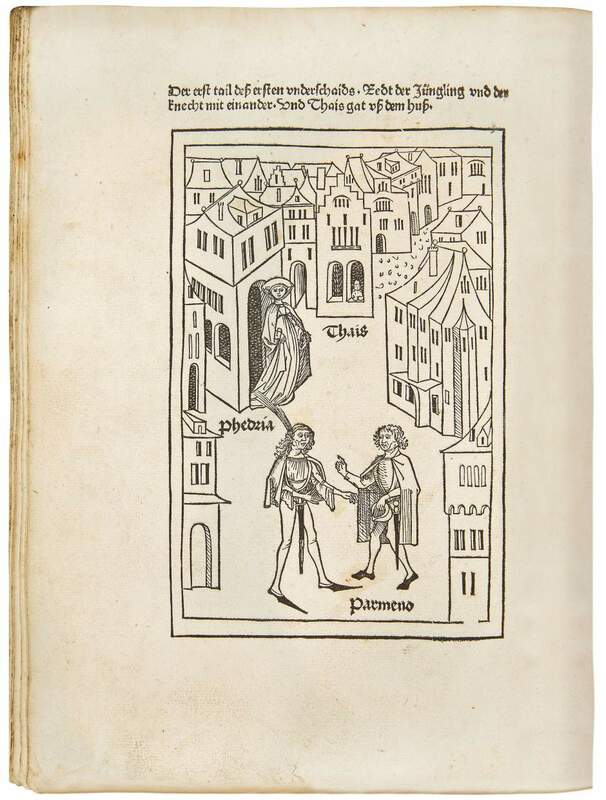 The Ulm burgomaster and humanist Hans Neithart (c. 1430-c. 1490) commissioned the edition from Dinckmut, and was also the translator and editor of both play and commentary. The unique woodcuts, showing the characters of the comedy in front of various town sceneries, give an impression of how a play might have looked on stage in the 15th century. The anonymous artist is named ‘Master of the Ulm Terence’ after the present edition, and his work represents an important highlight of Ulm book illustration. II. This is the earliest medical manual written in German, which briefly covers all topics of medieval medicine. Its author (fl. about 1250-1300) was a surgeon and probably town physician in Würzburg and completed his text by the 1280s. A very broad manuscript tradition, nine incunable editions, and further publications up to 1658 testify to the vital importance of this textbook.